The first win8 tabs arriving. 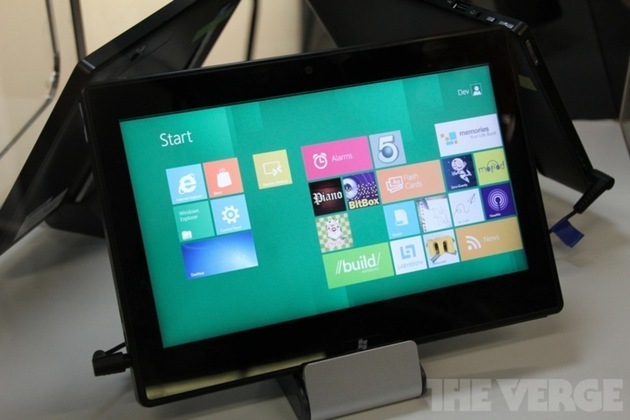 Texas Instruments is showing off a Windows 8 ARM tablet at CES 2012 this week. Powered by the OMAP4470 processor and Windows 8, the unnamed tablet is expected to make an appearance at TI's CES booth. The firm previously refused to show off its Windows 8 ARM work at BUILD last year, keeping its reference design tablet behind glass, running the dual-core 1GHz OMAP4430. The OMAP4470 dual-core 1.7GHz processor will power this latest tablet, offering an early look at Windows 8 ARM performance. We're still not sure on the state of a traditional desktop experience in Windows 8 ARM, but TI previously informed us that they expect Windows 8 tablets to ship with this type of processor, once Microsoft has it ready.